“He that is without sin among you, let him first cast a stone” (John 8:7). For Greece, the 19th century witnessed a successful war of independence following four centuries of oppressive Ottoman rule. The Ottomans left Greece in economic tatters, with industrialization inching along at a snail’s pace. Over 80% of Greece’s population resided in rural regions tending to an agrarian mostly self-subsistence economy. By the late 1800s, Greece called upon a generation of young Greek men to immigrate outside of Greece to find opportunity with the compact that funds would be sent home. In the United States, technological innovation, mass production, and industrialization translated to a boom economy in need of able-bodied laborers. The immigration spigot from a war-torn Europe opened full-throttle and European immigrants poured onto American shores. From 1880 to 1925, nearly 500,000 Greeks, 95% of them men, most from the Peloponnese immigrated to the United States. The next 20 years witnessed another 35,000 immigrants, predominantly women introduced by proxenio, to join their contracted husbands and future families. The early immigrants found opportunity in mines, mills, railroads, factories, boot black shops, and kitchens. They took on the most menial labor jobs often in squalid conditions. From Utah’s copper mines, Pennsylvania’s steel mills, building railroads, tending to silk and textile mills, they arrived in droves to seize opportunity. Another wave followed World War II and the Greek civil war. These early Greek-Americans lived frugal lives. They worked very long and hard hours and saved their pennies, which eventually added-up enough to make the transition to become small retail businessmen. In Chicago, by 1920, one of every three restaurants was owned by a Greek-American. In New York, New Jersey, Pennsylvania, and New England, Greeks owned hundreds of restaurants, candy kitchens, shoeshine stands, grocery stores, and tailor shops. For those immigrants that arrived from their small horia (villages), the Greek Orthodox Church served an important unifying role, as it had done during the formidable centuries under Ottoman rule. It was the Church that sustained their faith, heritage, culture, traditions, and of course, their education. In America, the Church served a similar role as a fountain of faith and place where people with so much in common could gather, socialize, network, assist one another, and even meet a future spouse. These early Greek-American business owners, flush with success, began to invest in their communities by establishing parishes. By 1920, over 130 Churches were built and established in large and small cities throughout America. They created a host of hubs and spoke cultural and fraternal organizations, such as AHEPA, and dozens of federations representative of the region they came from in Greece. These important organizations helped their respective members assimilate into the American mainstream, learn English, find jobs, and even fight racism, bigotry, and inequality. This very newspaper – the Herald – played an important unifying role in keeping the language and news of Greece alive. The Church’s role in being a springboard of faith and culture and facilitator assumed a far more important role than it ever did back home. 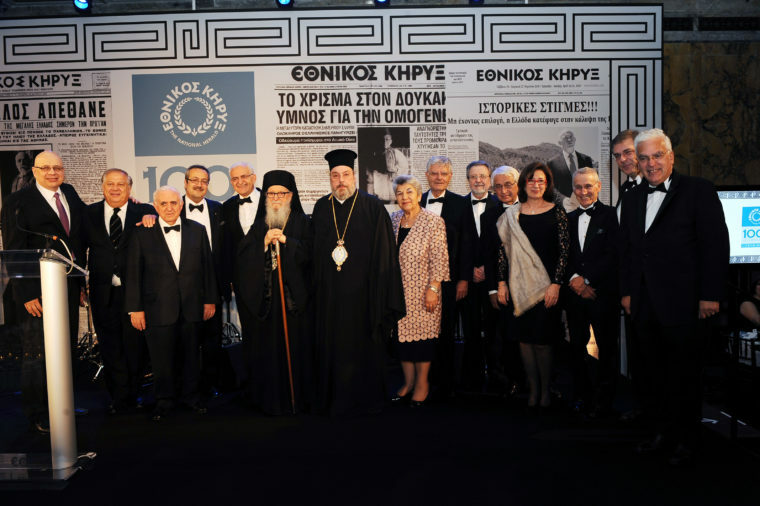 «Εθνικός Κήρυξ» celebrated it’s 100th anniversary in 2015. (L-R) Amb. Nikos Emiliou, Philip Christopher, Nick Andriotis, Dr. Spiro Spireas, Antonis H. Diamataris, Archbishop Demetrios, Metropolitan Evangelos of New Jersey, Stella Kokolis, Dr. Evangelos Gizis, Dr. George Kofinas, Nikos Tsakanikas, Amb. Katherine Boura, Amb. Loucas Tsilas, Amb. George Iliopoulos, and Amb. Vasilios Philippou. Photo by TNH/Costas Bej (FILE). Since ancient times, education is a value of paramount importance. The early Greeks, no matter how wealthy or poor, sacrificed so much to educate their children. Indeed, in a generation the progeny of these families ascended to become one of the most highly educated and successful ethnic groups in America. The move to the mainstream resulted in the Church’s becoming more “Americanized.” The Church adopted anglicized mores mirroring the Anglo-dominated society in which we live. The shift created friction within Greek communities, with issues such as the “language” of the Liturgy lingering to this very day. That is particularly true with the last and final wave of immigrants that arrived in the late 20th century wanting to maintain the Church’s ethnic identity as a reminder of the world they left behind. During the early years of immigration, parish priests, diocesan bishops, and hierarchs were led by charismatic and strong personalities such as Archbishops Athenagoras and Iakovos. That generation were not just clerics, but well-educated theologians, intellectuals, and skilled administrators. Priests and hierarchs that studied at the Theological Seminary at Halki, in Constantinople, and at seminaries in Athens and Thessaloniki, received coveted educations in theology, dogma, patristics, humanities, sciences, and philosophy. They were the best and brightest and were able to marshal the resources to help their respective communities grow and prosper. Archbishop Athenagoras started GOYA and Philoptochos and helped quell divisions emanating from the pro- and anti-monarchy factions. 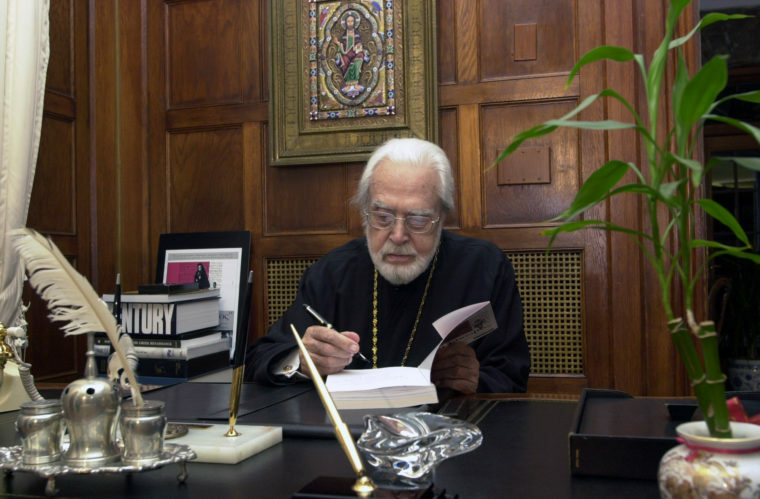 Archbishop Iakovos followed in Athenagoras’ footsteps, bringing the Archdiocese and Greek-Americans to the forefront. Who can forget the brave march with Dr. Martin Luther King that landed him on the cover of Life, then the most popular magazine in America? Archbishops Iakovos. Photo by TNH/Costas Bej (FILE). The Greek-American family demographic of today is in flux. Like mainstream America, today’s Greek Orthodox family is likely to be interfaith, intercultural, and even interracial. 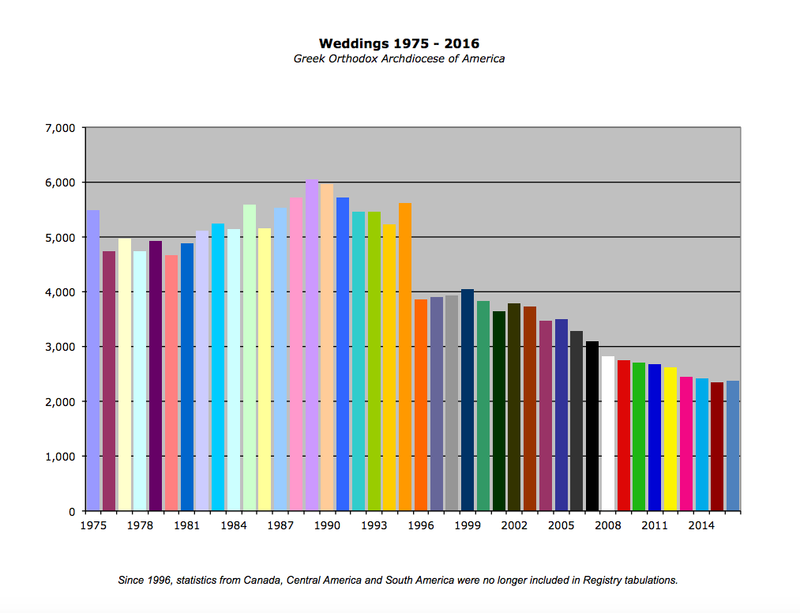 The statistics are alarming, and should the trends continue, such as marriages within the Greek Orthodox Church, sustaining 500+ parishes is not a viable proposition. In short, the Greek Orthodox Church of America is at significant crossroads. The Church’s current economic state has been the centerpiece of controversy. We are witnessing personal indictments of character, assertions of poor discretion and judgement. However, the real indictment should be lodged against an anachronistic infrastructure and system established during the Church’s nascent years over a century ago. The shift from a “Diocese” to “Metropolis” structure, from purely the prism of an administrative unit is a shift to decentralization and at the root of the problem. The education, learning, and quality of the Church’s clergy and hierarchs in conveying our Lord’s mission is not at issue. What they lack are the skillsets, knowledge, and experience to operate a successful enterprise, again from a purely administrative standpoint. Bifurcating the faith from the “word” is not without challenge. However, even our Lord declared: “Render to Caesar the things that are Caesar’s; and to God the things that are God’s” (Matt. 22:21). We have arrived at the juncture where we need to do just that – to involve and vest professionals and experts with authority to carry forth part of the Church’s mission with respective to administration. The Greek Orthodox Archdiocese of America today consists of Holy Eparchial Synod, presided by the primate (archbishop) and the eight metropolitans, each representing a respective metropolis of which there are nine, which include the Direct Archdiocesan District in New York presided over by His Eminence, Archbishop Demetrios, Geron of America. 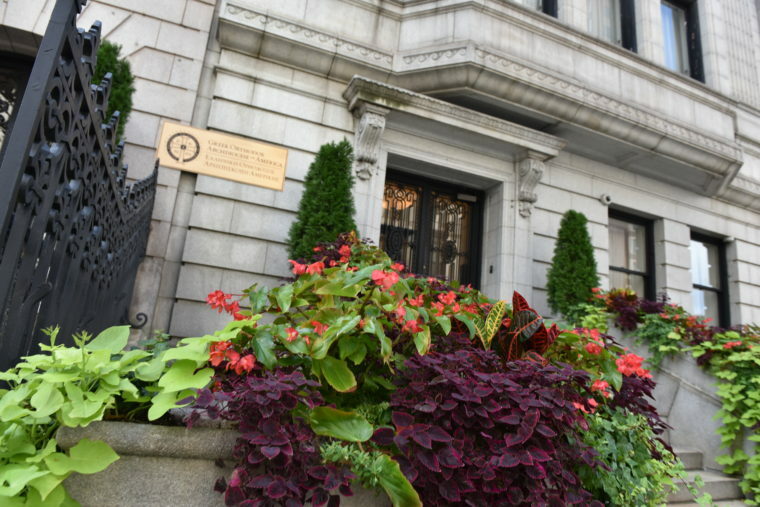 Each metropolitan and metropolis employs a staff headed by a chancellor, who serves as the metropolitan’s right hand in implementing policies and handling communications and interrelations with parishes. There are about 550 parishes in the United States tending to paid stewards/members that arguably total somewhere between 350,000-400,000-member congregants. The actual number is a mystery that speaks to the need for centralization and transparency. His All Holiness Ecumenical Patriarch Bartholomew serves as the Archbishop of Constantinople, New Rome and as the “First Among Equals” of all Orthodox patriarchates and over the Holy and Sacred Synod and over metropolitans and archbishops of the Patriarchate. His responsibilities and jurisdiction includes a host of important Synodal Committees and regions worldwide. He also is under the proverbial gun, due to the harsh and threatening geopolitical and religious tempest arising from the location of the Patriarchate in modern-day Turkey. For purposes related solely to this discussion, and with respect, the reader is indulged to separate the theological, spiritual, and mystical mission and purpose of the Church from the way its administrative functions operate. Furthermore, consider this administrative unit as analogous to a retail franchise system – whether it be a hotel chain, fast food retailer or other national franchise with 500+ locations across America. Our hypothetical franchise system is overseen by a board of directors and chairman, residing in a continent thousands of miles away. Apart from sporadic visits and hotel stays, the chair is not well versed and experienced in life in America. The board of includes several interlocking directors with real and apparent conflicts of interest, given that they report, are subservient, and accountable, to the chair. The 500+ franchise system is segregated into nine national regions. Each has its management team and is led by a metropolitan who is an independent CEO, operating independently from the other regions. Each CEO has the authority to hire/replace his own staff based upon unilaterally imposed criteria and qualifications . The chancellor or CEO in each of the nine regions is a cleric. The CEO of the entire franchise is based in New York. His authority over his own region is like the other CEOs, but limited with respect to the national franchise. He has limited authority to promulgate, enforce and resolve national policies and disagreements that arise. He is the face of the franchise for purposes of representing the franchise to the outside world, ironically like the role that the president of Greece has. In sum, the eight CEOs report and are accountable to the chair back at the Phanar. failure to manage, develop, and monetize real property assets, effectively resulting in millions of dollars of unrealized revenue and income. The list is not comprehensive and consulting firms the likes of McKinsey, Stephens, E&Y, and others are best suited to analyze, assess, report, and suggest changes and solutions. This model needs overhaul and change if the franchise is to succeed for the long term. The cleric’s role and function is to bring his flock closer to Christ so that we may find our eternal salvation. Secular humanism and the “grayness” of modern life makes the cleric’s mission and role more important than ever. Just as it is imperative for any business venture to have the best management team, so it is to have the very best serving as clerics and lay people in the Church’s ministries. The fact that there is no budgetary line item for recruiting clergy speaks miles about the administrative disorder that exists and the need for effective structural change. It does not matter whether the next archbishop has an MBA from Harvard; he too will inherit an unfixable mess with the status quo of the administrative functions of the Church. Archbishop Demetrios, an incredible theologian and pious and devout hierarch, often speaks eloquently of the millions of “unchurched” souls in America, of people who believe in God searching for a place to call their spiritual home. It is a “half-glass empty” pity, but also a “half-full glass full” of glaring opportunity given Orthodoxy’s manna and countless spiritual and mystical treasures. We Greek-Americans have fulfilled and exceeded the wildest dreams and expectations of the herculean immigrants and forbears that arrived on these shores to claim their right to opportunity. We are educated, successful, and lead in every walk of life. Engage us as stewards of our faith to assist: not just to fill the church coffers with funds. Engage our talents, expertise, and knowhow. Let us be the Church’s “Caesar” when it comes to how it operates and allow you to flourish in proclaiming His Gospel and promise of hope and salvation. Ari Stone is a journalist and former law professor residing in Washington, DC. In my prayers this morning on my physical birthday, I mourned the loss of the community practice of prayer in the Greek Orthodox Community where I am located. The Orthodox Church in its fullness is iconic. The unity of the Orthodox Church was maintained in earlier centuries by God’s grace in a visual and musical form permeating the culture. The defense of holy icons by St. John of Damascus and all the prayers he wrote and others to be sung expressing theology by choirs do not have the centrality of focus in what I see in the local Greek Orthodox Church. As a monastic woman and missionary schooled in the arts and with a blessing for our New Tikhvin Skete of the Holy Mother of God to ‘Share the Love of God through Music and the Sacred and Creative Arts , this makes me very sad. Especially sorrowful is the loss of the adult choir in the local Greek Orthodox parish and the repressive actions to make sure the adults are not revived or reorganized into ongoing singing ensembles for weekday services or any form of regular community worship as a continual means of education for all ages and languages to knew and deepen their understanding of those things of God and the Bible and Church Tradition. The essential charitable functions of a parish as whole and individuals sharing what God gives are not absent, but they too take a back seat to “the business development”. A pilgrimage is being organized within the Atlanta Metropolia district to a site a day’s journey away by bus to hold community prayers by a special ikon brought from Greece, yet in the Community Center (Hall) there is NO home or place for any physical icon or prayer corner as one would have in a home. Metropolitan Alexios has sent out an additional announcement for the attendees of the Icon Pilgrimage to ‘wear their Greek Dance Costumes” but no time has been allotted for a training for a community choir response for this special pilgrimage to the Holy Ikon coming from Greece. I join Mother Elizabeth’s lament that choirs and congregational singing in Church services are being marginalized. I see a push for “byzantine chant schools”. This development will only serve to further embolden what I see as the “tyranny of the chanter stand” in our parishes. Attempting to re-establish Byzantium in 21st century America will not bring back the 60% of our youth who are leaving the Church after college or reverse the problems facing our Church in this country. If one looks at the history of choirs in the Greek Archdiocese of America it is interesting to note how they came to be in the first place. When the first wave of Greek immigrants arrived in this country==between 1890 and 1914– they did not have any experience with mixed choirs because essentially they did not exist in their churches in Greece or Asia Minor. For that matter sunday school and youth organizations did not exist either. It was only after the immigrants noticed that these institutions were an integral part of the Protestant churches around them, did they take notice, Additionally their children, assimilating rapidly in the public schools they attended, openly asked why their ” American” friends had choirs, youth groups, and sunday schools in their churches, and “why don’t we?” The immigrants realized that in pluralistic America if they were going to keep their children in the church they needed to adopt and adapt these practices, and they did. For that generation, and the subequent generations that followed, singing in the choir was something that young people looked forward to, and was a major way they participated in church life. Its unfortunate that in some parishes only Byzantine chanters exist, and in others the choir and and the organ –if there is one–have been replaced by chanters only–and unfortunately some former choir members have even left the church. Yes we can go back to the way it was in Byzantine times, and we can emphazise the use of Greek in the services, and over emphasize Greek cultural activities, including the festivals. But if we want our children–now entering the sixth generation and overwhelmingly the result of interfaith marriages to remain Orthodox Christians, going backward is not the way to do it. I agree with you 101% George. “The tyranny of the chanter stand” as you name it also adds to the pain and actions forth coming from a negative and all male cultural dominance placing women and children in a very unbiblical and unOrthodox Theology frame of foment rather than formation. Using music and choir participation to bring people together from all walks of life in a family like and healing manner is now at hand for our work in Flagler County, Florida. After several years of suffering this inflicted pain and discrimination, we are in place to go forward in the monastic tradition given us by Archimandrite, Father Roman Braga+ (2015) to have a safe place for music study and small group prayer missionary outreach of our Christmas Monastery School of Music and the Sacred and Creative Arts of our New Tikhvin Skete of the Holy Mother God. We pray we will find support for our Pan Orthodox Christian effort to our neighbors in a Go Fund Me account within the ranks of the OCL, Orthodox Clergy Laity supporters and readers. Mother Elizabeth https://www.crowdrise.com/o/en/campaign-manager/edit/nancy-laskos/literacy-now-through-music-and-the-arts/campaign.